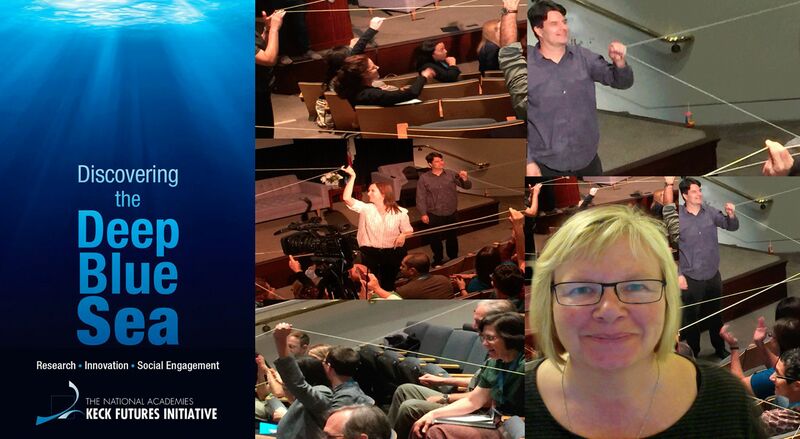 This was our challenge in designing the Immersive Mesopelagic Performance Lab, a workshop where artists and scientists collaborated to research and develop a “performance lab” designed to allow humans to inhabit the perspective of deep sea organisms and embody different processes and patterns key to the daily life and health in the Mesopelagic Zone of the ocean. As, a group of 6 scientists and artists, we spent a week exploring this concept, IMPel, investigating this interdisciplinary space with scientists and non-scientists, exisiting “up close” to remote ocean life creating new perspectives on ocean research for scientists, dynamic content for artists, and a more direct emotional and intellectual connection between non-scientists and the Mesopelagic zone. The week was successful in exploring the many possibilities, a final public performance as well as creating “rough cuts” of two or three discrete experiments. This project was supported by a competitive seed grant from the National Academies Keck Futures Initiative (NAKFI) and the Gulf Research Program (programs of the National Academies of Sciences, Engineering, and Medicine). The grant supports collaborations and investigations resulting from Discovering the Deep Blue Sea: Research, Innovation, Social Engagement, the 14th annual Futures conference, held last November and of which, we are all now Futures alumni. This IMPel project is an extension of the DAY IN A LIFE working group that emerged organically out of the larger Communication, Adaptation and Resilience and Climate Change working groups at NAFKI. As artists and scientists working together, we quickly developed a shared passion for using theater and installation as a kind of “radical play” to disrupt and enliven traditional ways of researching and learning about the deep ocean. We genuinely enjoyed the ratio of artists to scientists, and the ease with which all individuals contributed to the overarching project idea. After throwing together our presentation in the pressure-cooker / quick turnaround framework of the conference; we were eager to gather and spend more in-depth time developing our idea… hence IMPel. Scientist: Dr Steven Haddock, Senior Scientist / Marine Biologist, Monterey Bay Aquarium Research Institute (US), Adjunct Professor: University of California, Santa Cruz. Artist: Lisa D’amour, Playwright / Interdisciplinary Artist. (US) Finalist for both the 2011 Pulitzer Prize for Drama and Susan Smith Blackburn Prize. Past recipient of the Alpert Award for the Arts, the Steinberg Playwright Award, and is a 2013 Doris Duke Artist. Scientist: Dr Heather Spence, Marine Biologist, Musician.Heather Spence uses science and art to harmonize human-environment interactions. Artist: Dr Eleanor Gates-Stuart, Honorary Professorial Fellow, Faculty of Law, Humanities and the Arts, University of Wollongong and Visiting Research Scholar: Australian National Centre for the Public Awareness of Science (CPAS), Australian National University, Visual Media artist whose focus is primarily on scientific exploration and technology (AUS). Specialist: Arthur E. Newell, Research Specialist.Woods Hole Oceanographic Institution (US) Ocean acoustician. Designer: Stephen Petrillo, Lighting Designer (US) – a New York and Boston based lighting designer with over 35 years of experience in theatre, dance, opera, music and touring. Ongoing Post Conference: KECK Futures alumni.